Fate of ME846 Lancaster 1 619 Sqn. Elizabeth Mona McDermott was born on July 1st 1890- at 11.30 a.m at 114 Argyle Street District of Blytheswood in the Burgh of Glasgow, to Charles Joseph McDermott, a Commercial Traveller and Margaret Wishart McDermott nee Aitken. McDermott was born in Dublin Ireland in 1859/60. At time of marriage on September 3 1889 – he was 29 and he was living at 41 Amiens Street Dublin. He listed himself as Mercantile Clerk. Charles McDermott's mother was called Lucy Rowland. At aged 1 in 1891 Elizabeth "Mona" and her family moved to No 3 Highburn Crescent, in the district of Partick, County of Lanark.. Here her parents had another baby girl called Isabel" Norah" Cecilia McDermott on October 2nd 1891. Norah would eventually become our grandmother. Shortly thereafter Mona had a little brother born, Gerald and a little sister called Margarita (both died). Janet McHand ?a servant from Scotland. It is not clear where the family was living at this time. We know that she married Percy Mitchell in Lyons France sometime between 1911 and 1915. Judging by the Page No 780 it is likely to have been somewhere around 1913. We assume Percy Mitchell was killed in WWI but have no definite records yet. It is most probable that Percy Mitchell was father to her son Tony. More research on WWI records needs to be done. There were definitely a couple of WW1 casualties called Percy Mitchell. It is very likely that her son Jack (always to be known later as Tony) was born in 1914. Searching through all the records there was a J.A Mitchell born in Cairo between Oct ?December 1916. However, there is another Jack L. Mitchell born in St. Pancras in 1914 to mother with maiden name McDermott. This appears to be the only Mitchell with correct mother maiden name born in the time frame. Mona was also a dancer with CB Cochran's Young Ladies but do not have dates or any further details yet ?more research to be done. In 1920 Mona as Elizabeth M. Mitchell married Walter Sherwin Engall (possibly born in 1888 Brentford, Middlesex), it appears he was connected to automobiles in some way. They appeared to live in the Middlesex area. 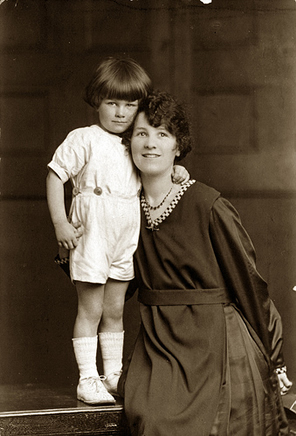 It is assumed that Mona was living with her son Tony and possibly her mother , Margaret McDermott who at this point was separated from her husband Charles. Tony, or Jack A. had also changed his name to Engall, an indication that his father a) was Percy Mitchell and b) was no longer alive. On January 24th 1936 Mona boarded the ""Strathnaver" London- P & O lines bound for Brisbane ?her route was to Tangier Morocco - presumably to visit her father Charles Joseph McDermott who had gone out there on November 30th 1933. At that point her address is listed as: Thames Cottage, Thanis, Middlesex. On 20th March 1936 Mona (Engall) returned from Tangier on board the "Narkunda", her address Thames Cottage, Riverside Staines so it does appear that she always lived in the Staines area during her marriage to Walter Engall. In 1936 Walter S. Engall dies, whether Mona was there or in Tangiers at the time is not sure. Cousin "Tony" was always a mystery. We had heard that he was killed in Tobruk in WWII but had not further knowledge of his name or address. However, having identified Mona's two husbands "Percy" Mitchell and Walter Engall, it was easy to locate "Tony". We now find that Jack A. Engall married a Maureen Albery in 1940 - at Westminster ?there the name shows as Mitchell or Engall - so he was obviously born Mitchell and then changed his name to Engall - hence we now know he was born prior to 1920 ?see above. Jack A. Engall (cousin Tony) was killed in WWII in 1942 listed 2nd Lt. RA He is listed in the UK Army Roll of Honour, 1939-1945 ?his name is given as Jack A. Engall. He died on 31st May 1942 in the Middle East ?his regiment at death was the Royal Artillery. No 155219. There is no indication that he had any children or whether his wife Maureen nee Albery married again. There is a strange entry in the Marriage Index in Norfolk of an Elizabeth M. Engall marrying someone named Howes in July, Aug, Sept 1939 (vol. 4b p.668). However, it is difficult to cross reference this entry or find out if the marriage ever took place. Certainly Mona never changed her name to Howes. Sometime in 1940 Mona appears to have joined the Civil Service. According to her later immigration papers she appeared to read French (not surprising since she went to school in Belgium) but she also seems to have read Spanish and Italian in addition to English. On 20th January 1941 ?Mona boarded the "Georgic" Cunard White Star Limited, at Liverpool bound for Bermuda ?here she gives here address as (this is speculative spelling) Maycote (?) Bundy's Way, Chertsey Lane Staines s Middlesex . ?everyone on this ship seems to list themselves as Civil Servants. Nothing more is known about Mona until her emigration to the United States aged 53 on September 22 1943 via Pan American Airways ?her immigrations papers suggest that she had come to marry an American - c/o Sgt. Shropshire 17002849 Headquarters Gov. 63rd Infantry Division, APO 410 Camp Van Dorn, Mississippi USA.. She had never been to the US before. She was going to be staying at the Hotel Wellington in New York which still exists today on the corner of 55th Street and 7th Avenue. She had $601.50 on her. Her height 5.5", eyes brown. Her race Scots/Irish. She was also able to read English, French, Italian and Spanish. Her last permanent residence was shown as Imperial Censorship Bermuda, this confirms that she was working for Censorship as a civil servant. On September 29 1943 Mona married Ben H. Shropshire in Jefferson County Alabama. The next recorded event was in 1949 when Mona's father Charles McDermott died in Tangiers aged 89. Around this time we have a photo of Mona in Utah. In 1964 Mona made a trip to England where she caught up with old friends and Rosemary has some information of this visit. In 1972 I was living in Washington D.C. and was contacted by a member of the family. A ring had been left to Rosemary by Mona and I managed to get this and pass it on. Rosemary had done a lot for Mona on her trips to England and this is really the only link left to her. Whether Mona had three husbands or four is not clear. More work to be done.